Decorative glass that we produce falls into two distinct categories: decorative glass and decorative mirror. We then further subdivide these categories into 3 options or calibers for your design. At the simpler end of the spectrum, we involve techniques and materials to faithfully reproduce your artwork/brand/logo with colour matching, basic screen-printing and colour blending. This caliber of design and item is affordable for any budget. Further up the scale, we involve sandblasting, composition leaf, complex colour blending, photoscreen and mica powders. Items created of this caliber never fail to draw attention. 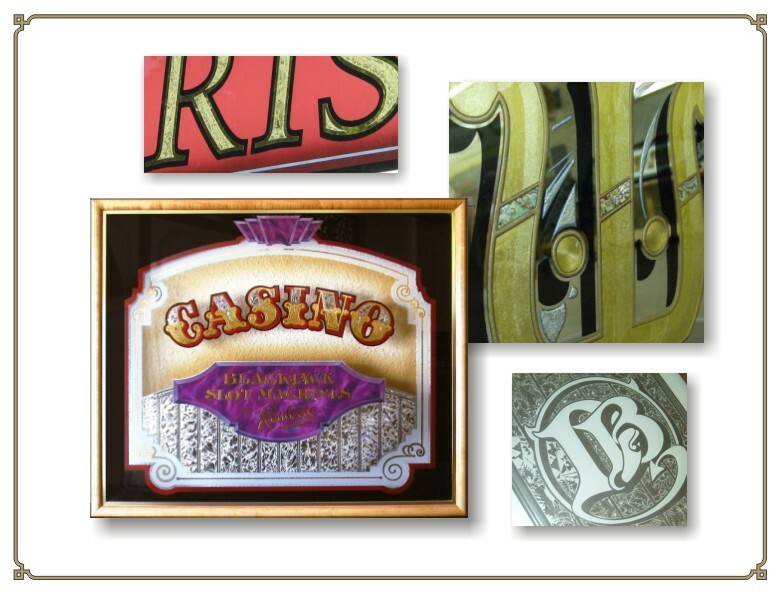 The highest caliber items feature any or all of our most impressive techniques and materials including: 23kt gold leaf, acid stipple and etching, glue chipping, appliques of mother of pearl, abalone, airbrushing and brush colour blending, all of which result in a truly one of a kind piece. Not for every budget, but well worth the price.